For more on this event and how to attend, visit the ABX 2016 website. Join Halvorson Design's Rob Adams and colleagues from Fort Point Associates and The Architectural Team as they discuss new ways of thinking in resiliency and urban design for successful waterfront redevelopment projects through the case study of Clippership Wharf, a mixed use development pursuing an aggressive 100-year resiliency strategy. The panel will examine strategies such as living shorelines and elevated public use areas to safeguard projects, increase resiliency, provide an attractive appearance and allow pedestrian access to waterfront development. This week, the Hancock Adams Green project in Quincy reached a milestone--Quincy's iconic, 20,000-pound gazing ball was returning to its rightful location in front of City Hall. 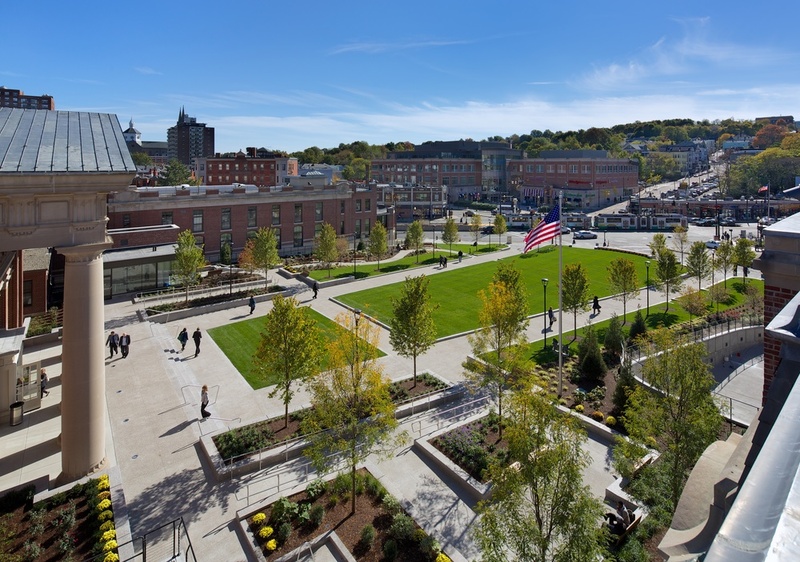 Read more about our work re-imagining this central part of Quincy here. And read about The Gazing Ball in The Patriot Ledger. The Halvorson Design team is participating in some of the great industry conferences coming this fall. If you are attending the ASLA Annual Meeting in New Orleans or if you're sticking closer to home for ABX 2016, be sure to find our leaders sharing their expertise. Using recent case studies with the City of Cambridge, Halvorson Design principal, Cynthia Smith, will focus on innovative strategies for multi-modal green infrastructure for urban streets. By bringing together diverse perspectives including a landscape architect, engineer and city official, this panel will compare various built projects and share lessons learned. To attend this event, visit the ASLA Annual Meeting website.